Grand Tour La Gomera private tour from Tenerife - La Gomera is much smaller island than Tenerife, but it has own atmosphere. 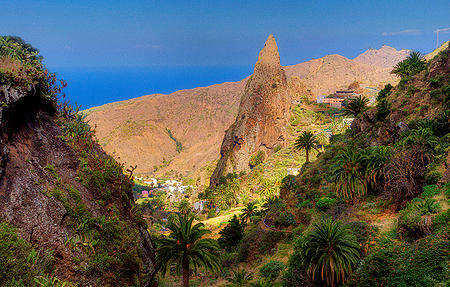 Grand Tour La Gomera private tour from Tenerife - the private tour route. 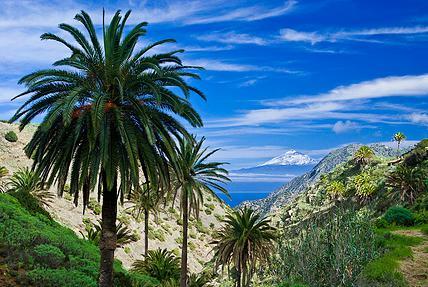 Grand Tour La Gomera private tour from Tenerife - magnificent views of Tenerife with its Mount Teide from La Gomera island. Grand Tour La Gomera private tour from Tenerife - beautiful panoramic views. 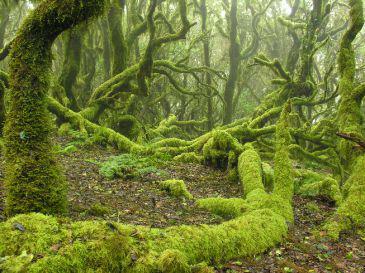 Grand Tour La Gomera private tour from Tenerife - endemic jungle in Garajonay National Park. 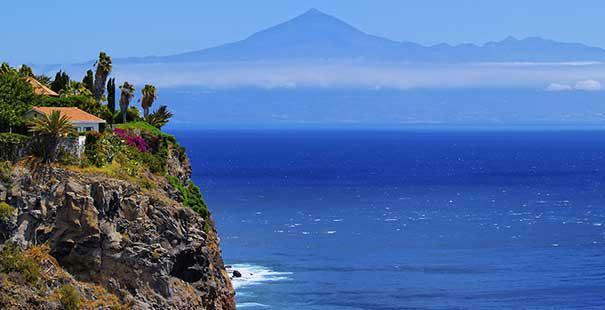 Grand Tour La Gomera private tour from Tenerife is the VIP class privately guided day tour to La Gomera by comfortable luxury limousine and fast ferry (or by mini-bus in the case, if there are more than 4 people in your group). This exciting full day private tour to the neighbouring island of La Gomera is privately guided especially for you by our experienced guide and driver. The trip starts and ends right at your hotel in any part of Tenerife. We will enter into the ferry in Los Cristianos harbor by car and after an hour we’ll arrive to San Sebastián de La Gomera, the capital of the island. Here we pass by the Asunción Church and the Hermitage of San Sebastián. We continue on up to Mirador de las Carboneras, where we stop for photographs of the Hermigua Valley and town. We then continue to El Cedro passing through the Garajonay National Park, declared as Universal Patrimony by the UNESCO. 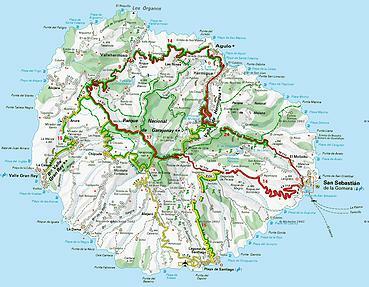 We will stop here to walk in the endemic jungle to feel and be in touch with the unique nature of La Gomera. Then we descend through La Palmita arriving at the small village of Rosas, where we can have lunch. Alternatively we can have a lunch in the capital of La Gomera island, at the end of our sightseeing private tour. Later we continue on to Agulo and La Castellana, making a stop at Hermigua, a beautiful village, set at the bottom of deep ravines. We return to San Sebastián, where there is free time to visit the last remaining historical fortifications of Christopher Columbus. 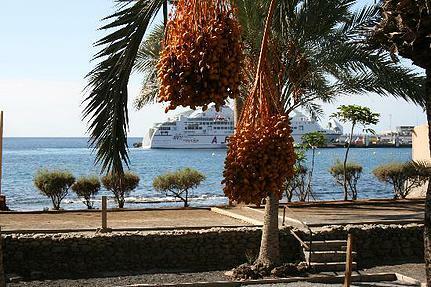 We return to Los Cristianos by ferry and then we drive back to your hotel in Tenerife. In order to make your booking of Grand Tour La Gomera Private Tour from Tenerife easy and comfortable Tenerife Host use the most advanced and user friendly booking platform TripsPoint.com where you can easily check last actual prices, the tour availability, required booking deposit and book this tour. To get more information of Grand Tour La Gomera Private Tour from Tenerife and do booking, please, click the button ‘Book Now’. You will be taken to the tour page at TripsPoint.com where you can easily book the tour. Once the booking of Grand Tour La Gomera Private Tour from Tenerife made at TripsPoint you will get your tour Voucher / booking confirmation with all details, including exact pick-up point, pick-up time, pick-up point map. If you have any questions about our Grand Tour La Gomera private tour from Tenerife, please, feel free to contact us. We will be happy to help you with any questions. 599€ – up to 3 persons. The price include the only our services, the ferry, parkings and doesn’t include meals, drinks or entry tickets. Booking Deposit required and the rest is paid on the day of tour. Our driver will take you right from the reception of your hotel anywhere in Tenerife.